On 1 August 2018, an Ebola outbreak was declared in Eastern DR Congo. This is the 10th outbreak in DR Congo, declared just one week after the ninth outbreak was declared over 2500km west in Equateur Province, adding to an already challenging humanitarian situation in the country. Violent protests have broken out in the North Kivu province of the Democratic Republic of Congo. Protesters have attacked an Ebola Transit Centre run by a medical aid organisation in the town of Beni. Hello, I’m Esther! I’m writing to you from the town of Beni in Nord Kivu, where I’m covering for the Base Manager while she is on leave. This is my third time working with Medair in DR Congo in the past eight years. Dr Trina Helderman led Medair’s response to the Ebola crisis in Sierra Leone in 2014, and joined the Emergency Response Team in DR Congo when the outbreak struck last month. 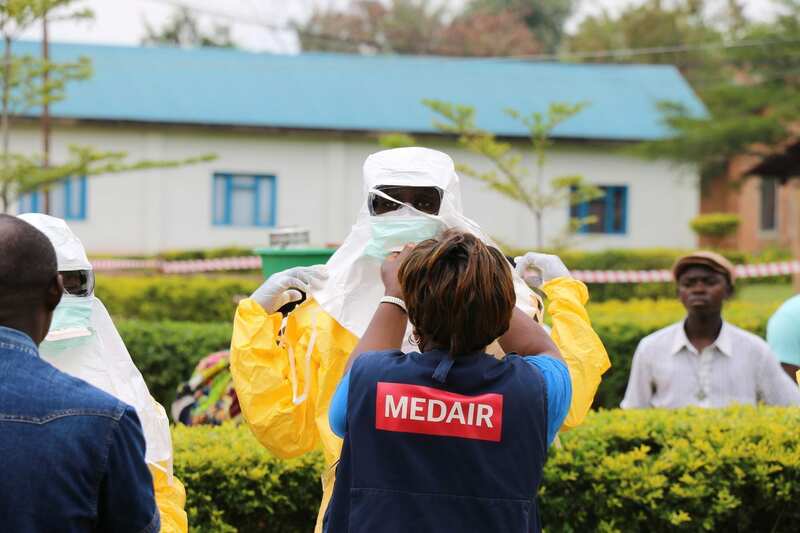 Medair’s current focus in the response to the Ebola outbreak is to establish screening points and fencing at select health facilities in Oicha and Beni health zones. In response to the recent Ebola outbreak in Beni Territory, Medair is working closely with health partners on the ground to provide a complementary and rapid response to the outbreak. Medair supports over 60 health facilities in Eastern DR Congo, with Health, Nutrition, Water, Sanitation & Hygiene (WASH), and related interventions. Beginning with areas where the risk is highest, Medair is ensuring supported health centers are equipped to triage patients at the center’s entrance before isolating suspected Ebola cases in a temporary isolation area, while arranging for referral. Health center staff are trained on how to consistently implement screening, isolation and referral without exposing themselves or other patients to the risk of being infected with the Ebola virus. In addition to supporting health centers covered by existing projects, Medair is working in five new health centers located in high risk areas. Our support includes infection prevention and control (IPC) measures and WASH support in the health facilities and surrounding communities. Medair sent members of its Global Emergency Response Team to DR Congo to provide technical expertise and surge capacity, as well as added local personnel on the ground. We are leveraging our experience responding to the Ebola outbreak in Sierra Leone (2014 – 2016). making a donation; your gift will be allocated to the Ebola outbreak in DR Congo and future Medair emergency responses around the world. For regular updates, sign up to our email list or follow us on Facebook, Instagram, LinkedIn and our Twitter feeds @Medair_DRC, @MedairInt and @MedairPress. Learn more about Medair’s work in DR Congo.